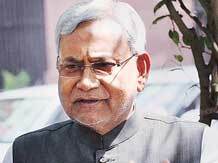 Bihar Chief Minister Nitish Kumar today supported the concern of BJP patriarch L K Advani that Emergency-like situation could emerge again and said that Bihar was "facing it on a daily basis". "Advani is among the senior-most leaders of BJP and his concerns should be considered seriously. As far as Emergency- like situation is concerned, we are facing it here on a daily basis," Kumar said. The Bihar Chief Minister was talking to media persons on the sidelines of an agriculture and food processing conclave in the state capital. Though he did not elaborate much on how the state was facing such a situation, he took the opportunity to attack Prime Minister Narendra Modi-led government at the Centre. L K Advani in an interview published in a leading English daily said, "Forces that can crush democracy are stronger...I don't have the confidence it (Emergency) cannot happen again." Kumar said, "Just see what kind of promises were made during the Lok Sabha polls and what has happened to them after they (BJP) came to power. They used to boast that they have completed one year and there have been no scams during the period, but see how many scams have started surfacing now." Referring to the controversy involving External Affairs Minister Sushma Swaraj, who purportedly helped former IPL boss Lalit Modi, a fugitive in money laundering cases pursed by the Enforcement Directorate, procure travel documents, Kumar called it a case of "favouritism" instead of humanitarianism and targeted the Prime Minister over it. The Bihar Chief Minister used a Sanskrit adage 'Maunam svikriti lakshanam' (silence is acceptance) to claim that the Prime Minister accepted the Swaraj-Lalit Modi issue. "His (Narendra Modi's) silence on the matter shows his approval and acceptance. It (Swaraj-Lalit Modi) is a clear cut case of favouritism, but the Centre is trying to wash its hands off the issue by saying it was done on humanitarian grounds. They used to boast so much about governance and now things are coming out," Kumar said.